I'm much happier with the card I am posting today. I guess this is more of a summery card than the one I posted yesterday. This was a real quick and easy card to make. I simply stamped the flower image and then colored it using my SU markers. I used my scallop border punch along the bottom edge of my decorative paper. Just below my scallop border I added a bit of decorative paper piercing. I did this free handed, but I still think it turned out okay. 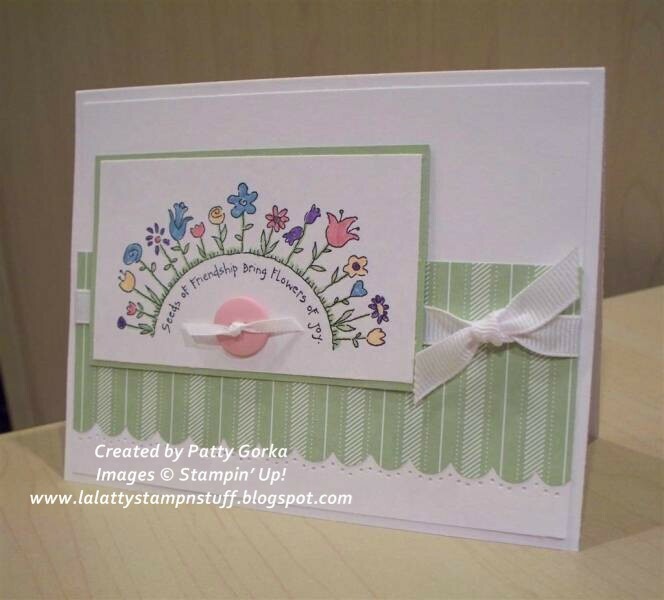 To help finish off my card I added a pink button with a small ribbon tied in the center. Thanks for stopping by and I hope you all have a great day! I'm going to try and make a card for today's Splitcoast sketch challenge and post it tomorrow- it looks like a great sketch this week. I like the little button under your image Patty, its a nice touch. LOVE IT! That image is so cute too. Great. Patty, your card is absolutely beautiful! I love the colors, the image, the punch. Wonderful! This is beautiful. I love all your cards and you make using white look so easy so I tried using white on a card I made last night, will be posting it for my DT challenge next week.